There are records of Jews living in China as early as the seventh century C.E. Many were Sephardic traders. 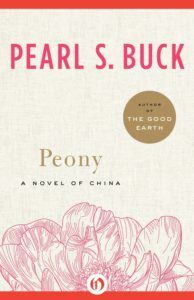 Peony is the story of one of these families, which has become affluent and well established in both the Chinese and Jewish communities. In particular, Buck focuses on David ben Ezra, a young man of Jewish-Chinese descent. Like many good sons, David is torn between his mother’s desire that he remain faithful to his heritage by marrying Leah, the daughter of the community’s elderly rabbi, and his own attraction to Kueilan, the daughter of a Chinese business associate of his father. He eventually realizes that his true love is Peony, the bondswoman who was sold to his family as a child. Peony loves him in return, but they realize that class distinctions make marriage between them an impossibility. The Jewish characters beyond the rabbi are either rigid and dogmatic like he is, or pragmatic and overly accommodating to the majority culture, such as Kao Lin, a businessman who “was a man who was Jewish with the Jews and Chinese with the Chinese.” Buck nowhere considers the ethical and moral teachings that have characterized so much of Jewish life and thought. Most indicative of a subtle, but pervasive, negative attitude toward Judaism comes with the frequent question of why so many people over so many generations have been prejudiced against them. The conclusion is that it is because the Jews resist assimilation and cling to their own suffering. Assimilation is portrayed as the inevitable path, but maybe even the desireable one. Some online commentators consider this a moving testimony to the unique and enduring character of the Jewish people. But written only a few years after the Nazi’s attempt to eliminate the Jewish people, I had to take these words as a condescending celebration of a dead community over a vibrant living one. I learned a great deal about China and the Jewish experience there from reading “Peony.” I also learned something about myself. Although I’m trained as an objective literary scholar, I read Buck’s novel as a Jew, and that emotional response is more fundamental to me and who I am than any intellectual experience.